It is too supportive of the Muslim Brotherhood and too close to Iran. It is a good idea in theory: Assemble a coalition of Sunni Arab states, call it the Middle East Strategic Alliance (MESA), and create a multinational military force meant to serve as a bulwark against Iranian aggression, terrorism, and extremism. Such an alliance would finally allow the U.S. to lessen its Middle East footprint, as the 2017 National Security Strategy recommended, and allow the Pentagon to redeploy some capabilities toward China and Russia — two of the "Big 4" countries that pose the greatest menace to the United States according to the latest U.S. intelligence community's Worldwide Threat Assessment. It is also hoped that such a self-sufficient Arab military pact would help bring some much-needed stability to the region. Where there are common interests and shared threats, such a coalition can succeed. The obvious example is NATO, which for decades was unified in its mission to hold the Soviet Union at bay. This raises the question, however, of what happens if one of the states in the emerging alliance not only views threats differently but is actively engaged in undermining other members of the coalition. A military alliance can only be as strong as its most corrosive link. This is the kind of mistrust the U.S. is grappling with in regard to Turkey, given the latter's debatable role as a NATO ally under President Erdogan. The latest iteration of MESA is supposed to be an amalgamation of Sunni Muslim forces, including the six Gulf Cooperation Council members — Saudi Arabia, the United Arab Emirates (UAE), Kuwait, Qatar, Bahrain, and Oman — in addition to Egypt and Jordan. Israel is not included in the alliance even though it has the most capable conventional military in the region. Nevertheless, the Jewish state believes that Iran constitutes the primary regional menace, which is a viewpoint shared by Saudi Arabia and the UAE, both of which seek to be the primary driver of MESA's policies. Look closer at the other members of the coalition and one will find widely divergent views on the risk posed by Iran. Kuwait and Oman are less than enthusiastic in their support for MESA, and both favor engaging with Tehran; Egypt and Jordan favor a more accommodating stance as well. Views of the Muslim Brotherhood also vary. Egypt, Oman, Saudi Arabia, and the UAE have cracked down on the local branches of the pernicious Islamist movement, with the latter working to make the Gulf a Muslim Brotherhood–free zone. Kuwait and Jordan, on the other hand, allow the Brotherhood to operate legitimately in foreign or domestic politics. Bahrain is similarly accommodating of the Muslim Brotherhood, but is aligned with Saudi Arabia and the UAE's vision on the need to push back against Iran. But there's only one MESA country that actively promotes the Muslim Brotherhood abroad in order to undermine other members of the coalition while sharing a proverbial bed with Iran: the Arabian Gulf emirate of Qatar. In fact, Qatar's pursuit of these pernicious policies — and other problematic actions — created enough bad regional blood that most MESA countries have severed ties with the emirate at one point or another and still remain at odds with, if not downright hostile to, the country's Al-Thani ruling family. Since this latest attempt to establish MESA began in 2017, two primary schools of thought have emerged in Washington to address the Qatar stumbling block. The first believes that papering over the differences is the best path forward because anything that will contribute to a united front is a net positive, not only when it comes to facing Iran but also when it comes to enhancing the regional buy-in on the economic portion of the Trump administration's soon-to-be-released Israeli–Palestinian peace plan. Moreover, since no one has clean hands in the region, singling out Qatar is not called for. The second school of thought is that Qatar should be welcomed back into America's good graces only once it alters its behavior. In this reading, some hands are dirtier than others. Make no mistake, the list of grievances against Qatar is long. It has fanned the flames of unrest on all sides of the inter-Sunni and inter-Arab conflicts with unparalleled financial and political support for a rainbow of militant Islamist organizations. Through a combination of the ruling Al-Thani family and/or wealthy Qatari financiers, the oil-rich emirate backs al-Qaeda affiliates, the Taliban, Hamas, and others, in addition to the Muslim Brotherhood. It also uses its state-backed Al Jazeera network as a worldwide loudspeaker to promote the most radical Islamist propaganda. Qatar's malign activities aren't confined to rustling feathers in the region; they directly target American interests as well. Qatar continues to conduct a wide range of information operations, including paying influencers, cyber-espionage, funding media, and buying think tanks. They're also playing the long con through influence operations that lavishly spend money on American universities. The curtain is pulled back further with the recent release of "Blood Money," a video that ties together various elements of the case against Qatar and illuminates how so much of the Washington establishment has been bought and paid for by the oil-rich Gulf oasis in a manner most Americans couldn't even begin to imagine. When President Trump visited Riyadh in May 2017, he implored the dozens of Muslim leaders gathered at the Arab Islamic American Summit to "drive out" the terrorists in their midst and unite to push back on Iran. Those in attendance understood the reference to the Qatari elephant in the room and shortly thereafter acted to bring the emirate in line with the priorities they share with the United States. Rather than changing its behavior, Qatar widened the scope of its relations with the other regional, non-Arab, Muslim Brotherhood–boosting regime in Turkey, posing additional challenges to America's interests in the Middle East. Despite Qatar's warm relations with a host of U.S. policy shops and mainstream media outlets, the country's regional isolation doesn't appear to be ending any time soon. 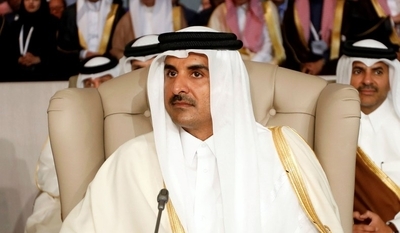 Over the weekend, the Arab League hosted a summit in Tunis where Qatari Emir Sheikh Tamim bin Hamad al-Thani abruptly left shortly after the group's secretary-general, Ahmed Aboul Gheit, praised Saudi Arabia's handling of its rotating Arab League presidency last year. The summit's final communique called for ties with Iran to "be based on good neighborliness, non-interference in internal affairs, the non-use of force or threats, and refraining from practices and actions that would undermine confidence and stability in the region," a not-so-subtle dig at Qatar's conduct. Just as Turkey's problematic policies put at risk NATO's concept of a shared defense, Qatar's role in MESA will constitute the alliance's Achilles' heel. It is always difficult to find common and unifying causes in the Middle East, but it is harder still when one member of a proposed alliance continuously seeks to undermine the others. Rather than seeking to paper over these very real differences, Washington should push for Qatar to change its subversive behavior abroad. At home, perhaps the old adage will finally ring true: Sunlight is the best disinfectant. But, as when a college bar flips on the lights at closing time, the American public will likely be shocked by what they see. What they learn about how Qatar plays the game in the United States will undoubtedly be an eye-opener.